Landing pages are a great way to generate leads and ultimately increase sales. In this post, we are going to discuss two basic types of landing pages along with the best practices in creating each to help you achieve your goals. Before we get to landing pages, let’s look at the buying or conversion process as a sales funnel. For this illustration, we’re dividing our funnel into three distinct phases. At the top of the funnel, we have those who are interested in a product or service, but not ready to commit. They are simply researching options and learning about what is available. 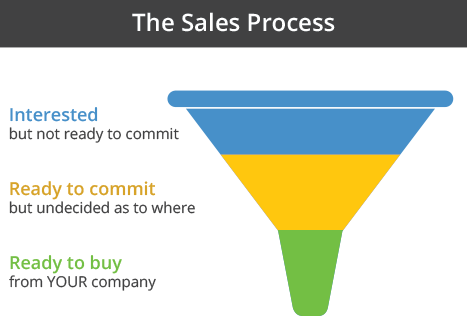 The middle of the funnel represents those who have decided to commit but still need to be persuaded as to why they should commit to your company in particular. The bottom of the funnel represents those who are ready to buy and have decided that your company is the one for them. In order to get a potential customer or lead to the coveted bottom of the funnel, you first need to get them to the top. SEO landing pages are a great way of attracting visitors who are searching for a specific product, solution or are simply in research mode. Search Engine Optimization (SEO) can be a powerful tool for driving potential customers to your website. Creating SEO landing pages is a great way of speaking to potential customers and enticing them into this first stage of the sales funnel. Remember, when a visitor comes to your site from a search engine they may not go to your homepage. Instead, the search engine may send them directly to a page within your site that is more specific to what they searched for. The topic of an SEO landing page can be based on a particular product or service, focused on a geographical area or answer a specific question a visitor may be searching for an answer to. For instance, a Realtor would find it helpful to create SEO landing pages for each of the specific areas they serve within a greater metropolis. Content can then be tailored for someone searching for a home in a very specific area. By creating unique landing pages for each community, they increase their chances of ranking #1 when someone searches for information on that area. A company with a variety of products would want to create landing pages for each of their major product lines and possibly even specific features or solutions of those products in order to increase the likelihood of ranking high in a search. Users often type questions into search engines, search locally, and get more and more specific as they refine their search. Ideally, each page on your website should be optimized around just a few keywords. Therefore creating several SEO landing pages that each focus on a specific keyword phrase is a great strategy. However, it is important to make sure the content on each page is unique. Don’t simply duplicate a page and only change out the keyword. Additionally, those pages need to be linked to in a natural way meaning that both search engines and visitors could naturally navigate and find those pages. They shouldn’t be “orphaned” pages. Typically, SEO landing pages have content which is more specific than a home page, but still has the full site navigation and maybe even a sidebar featuring related content and a call to action (or lead capture) with an offer that would interest a visitor at the top of the sales funnel. For a visitor who is in the middle of the funnel, conversion landing pages may be more helpful. A visitor in the middle of the sales funnel has already decided to buy, but not necessarily from your company. Middle-of-the-funnel visitors may have visited your site previously, but still need to be convinced that your product or service is the one for them. This starts with creating an offer for that visitor to convert on. For our purpose here, an “offer” and “conversion” isn’t a “discount” and “sale”. Instead, an offer can be a download, whitepaper, product specs or subscription to your newsletter and a conversion is simply capturing the lead. Once a lead has been captured with an offer, companies can market directly to a potential customer in what’s come to be known as “permission marketing.” The content from your offer should help position you as an expert and the conversion allows you to market and engage with them – ideally moving them to the bottom of the funnel. Conversion landing pages are more focused, offer-based, and have concrete goals. For these reasons, conversion landing pages generally do not have site navigation or other things that may distract a user or dilute your message. 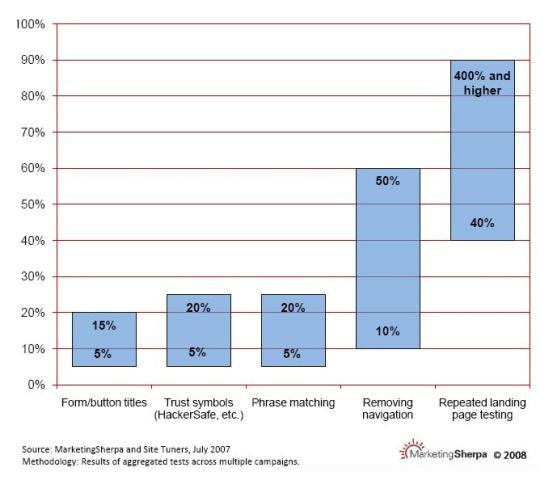 MarketingSherpa’s data shows the range of improvement resulting from landing page element testing. By removing the navigation you can improve the performance of your offer page from 10 to 50%! Every navigation element offers the page visitor a choice other than the action around which the page is presumably built. If conversion is the goal, be it a purchase or registration, removing those distractions is an effective tool. First, many visitors will bounce off a landing page in less than eight seconds, and if you want to have an impact, don’t dilute or distract from your key message. Once a prospect has been led to your landing page, reinforce the offer and get them to convert. If you keep the page focused, then you maximize your ability to test the page’s effectiveness and increase your conversion rate. No matter which kind of landing page you are focusing on, a marketing persona helps focus your content creation, landing pages, and offer strategy. A marketing persona is a fully realized description of your customer. The more detailed it is, the easier it is to think of offers and landing pages that will appeal to your ideal customer at each stage of the sales funnel. You can also have more than one persona if you find that you tend to sell to different types of people. What gender is your customer? What is the customer’s age bracket? What industry is your customer in? What is your customer’s job function? What kind of educational background do they have? What activities outside of work does your customer participate in? What geographic region does your customer come from? What does your customer’s day usually look like? Does your customer have children? What is your customer’s most pressing concern at work or home? Take some time to brainstorm your ideal customer. Start by examining trends and similarities in your current customer base. Make persona creation a team effort – different team members will have important nuances to add. Once you have that ideal person in mind, you’ll be able to craft landing pages and offers that are irresistible to them!